A group of scientific researchers and military personnel discover an alien spacecraft frozen under the ice in the Arctic. Retrieving the alien pilot, they take it back to their outpost to conduct research. 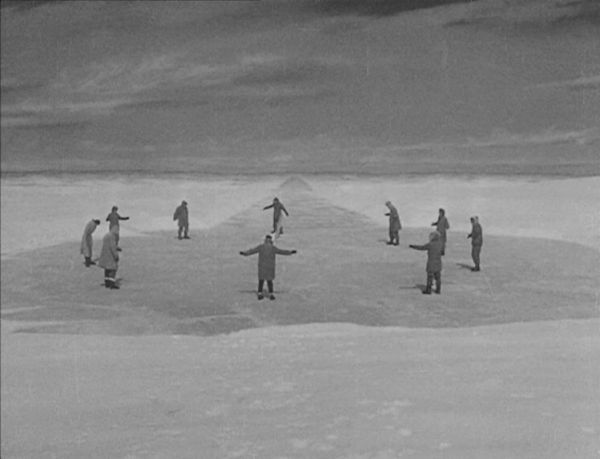 However when the block of ice it’s entombed in thaws, the creature goes berserk and sets off on a bloody rampage, killing anyone who crosses its path and feeding on their blood. The military personnel led by Captain Hendry decide enough is enough, and plot to destroy the creature before it destroys them. Based on the short story 'Who Goes There?' 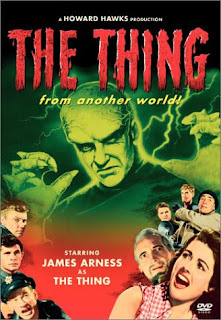 by renowned sci-fi writer John W. Campbell, The Thing From Another World is one of the earliest, and most successful amalgamations of horror and sci-fi. A precursor to the likes of The Day The Earth Stood Still, War of the Worlds and Alien, the film was produced during a time when the media was bombarded by reports of sightings of UFOs; a time that would become the Golden Age of sci-fi in Hollywood. 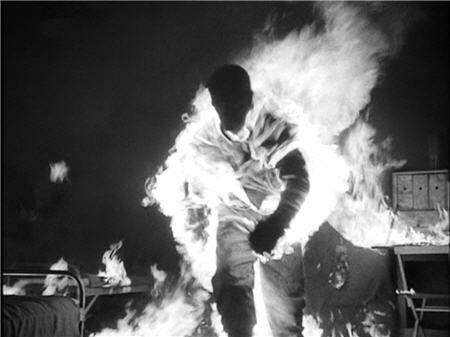 It also came out early on in the Cold War Years, and at times it is impossible not to view the film subtextually as an allegory of America’s fear of communism. The paranoia rife throughout the short story, and indeed John Carpenter’s masterful, visceral and chilling remake, is sadly absent from this adaptation, however the film is not without its own moments of macabre genius. An effective exercise in suspense and atmosphere, The Thing From Another World benefits from its isolated location, mounting tension and eerily effective atmosphere. Surprisingly, it also exhibits a rather cheeky sense of humour, too. When one considers it was co-directed and co-scripted by Howard Hawks however, this becomes less surprising. 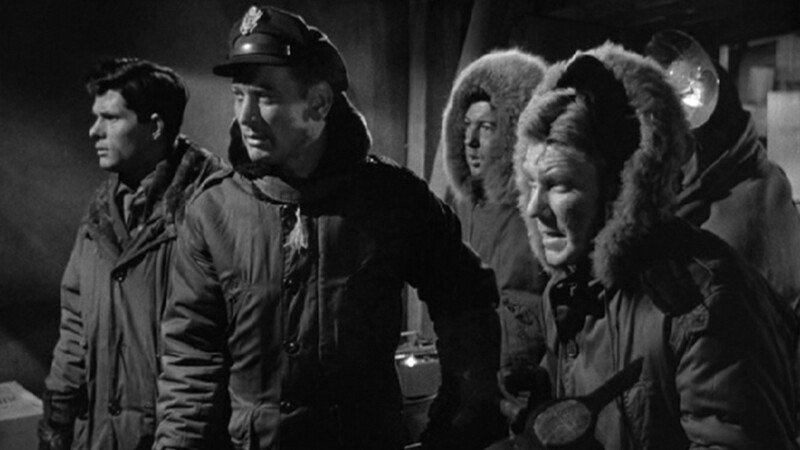 The camaraderie between Captain Hendry (Kenneth Tobey) and his men, and indeed the Captain and Dr. Carrington’s secretary, Nikki Nicholson (Margaret Sheridan) fizzes with all the wit and sharp delivery one would rightly expect from a madcap Howard Hawks’ movie. When one of the men is left to keep watch over the block of ice encasing The Thing, he says he’s going to read “A nice, quiet horror story.” While Nikki is still a far cry from Ellen Ripley, she is a robust heroine and more than holds her own amidst all the macho talk and alien-monster attacks; keeping herself together enough to ensure the other characters are never without coffee. They do like their coffee in this movie! She even ties up Captain Hendry in a sexually charged scene that helps flesh out the characters and give them some history. 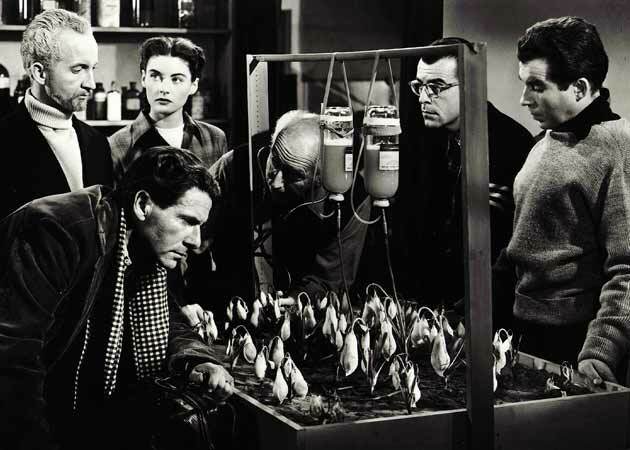 While Dr Carrington (Robert Cornthwaite) manifests a few characteristics of the typical horror movie mad scientist, he argues his beliefs articulately and presents a few convincing arguments about scientific progress. A number of compelling debates between him and straight-talkin’ Captain Hendry ensue; the latter wanting to destroy the alien creature, while the former insists they can learn from it. These debates would be echoed later on in the likes of George Romero’s bleak and bloody ‘scientists vs. military vs. zombies’ meditation on the dangers of martial law, Day of the Dead. Carrington muses that the human race knows relatively little about the universe and that we could benefit from communicating and studying the creature. He doesn’t seem to mind risking the lives of others to preserve the life of the bloodthirsty creature. This disregard for human existence over scientific research would ripple throughout Ridley Scott’s Dan O’Bannon scripted Alien, another film that was heavily influenced by The Thing From Another World, right down to the everyman characters and isolated locale. Another moment that was pretty much pilfered by Scott and O’Bannon is the use of a tracking system to locate the alien creature. 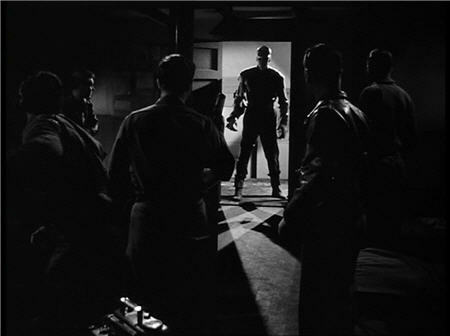 It begins to bleep, signalling 'The Thing' is near, as the group huddle together, turn off the light and await the inevitable – all the while the increasingly frantic beeps herald the approach of the monster – before the door bursts open and we see the striking silhouette. Dallas in the air duct, anyone? Reporter Ned Scott (Douglas Spencer) wouldn’t seem out of place in the likes of His Girl Friday or Bringing Up Baby, and he struggles to be heard when the military personnel refuse to allow him to report on the discovery of the spaceship. He sees it as a historical landmark that the public have a right to know about; the military believe such a story could cause widespread panic. These debates and altercations still wield a high degree of resonance today, especially when one considers how much ‘news’ the government suppress in the interests of ‘public security’, as evidenced in the recent WikiLeaks debacle. His protests of ‘freedom of the press’ are ignored by Captain Hendry who wants to keep a lid on things. For the most part, directors Nyby and Hawks adopt the Val Lewton approach and are suggestive in what they reveal to the audience in terms of the eponymous ‘Thing’; a glimpse here, a silhouette there. The more we see of the alien creature, and the more we learn about it from research conducted and concluded by the plethora of boffins situated at the lonely outpost, the less effective it becomes. Particularly when various characters start to draw comparisons between it and a carrot. After the alien thaws out, a prolonged game of cat and mouse bulks up the running time, with the creature sinisterly eluding the group at every turn, while picking off a few stragglers. The moody lighting and limited sets help to create a creepy atmosphere – those shots of the long corridors fading off into shadowy darkness could have been lifted right out of a Val Lewton production. Indeed, the Lewtonesque flourishes that are rife throughout the film more than make up for disappointing monster make-up. Still, a number of moments featuring special effects are still pretty effective today; particularly the little harvest of blood-gorged seed-pods (revealed to be more ‘Things’) as they pulse and quiver on their stalks; and the moment when 'The Thing' is set alight, only to rush into the cold night outside screaming and aflame, are memorably effective and provide some chilling imagery. 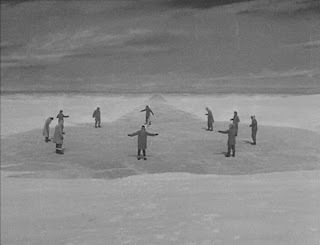 More arresting images come with the depiction of the men spreading out over the ice above the submerged spaceship to trace its circumference, accompanied by appropriately ominous music, and the moment when a door suddenly bursts open to reveal the monster standing behind it. 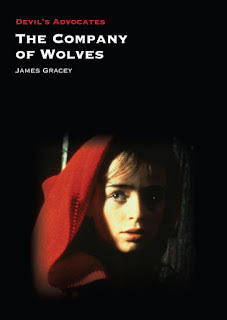 An intelligent, witty and atmospheric movie that still retains its moody effectiveness today. "Keep watching the skies!" Adaptation Aliens Allegory Arctic Classic Cold War Fifties Horror Howard Hawks John W. Campbell Sci-Fi Seige Short Story Socio-Political Commentary Who Goes There? I have been trying to watch this for almost a year now. I remember seeing it as a child and how it frightened me but now when I turn it on I just think "Gee, I'd rather be watching the remake" and turn to that. I know I need to give this one a fair chance! Marvellous review of a keynote 1950's science-fiction/horror film. I find the invasion narratives of the 50's interesting from a generic point of view. 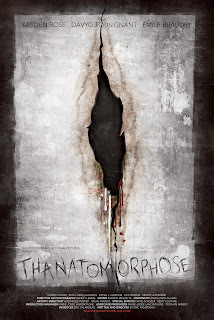 While they no doubt employ certain tenets of the horror film, the thematic subtext is almost always related to science, technology and politics. 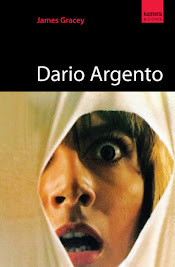 Like you I prefer to view them as horror/sci-fi films. A lecturer I once had was dead against this, and was utterly unshakeable in his belief they were horror movies. Highly contestable I think. Cody, while this is as far removed from Carpenter's remake as you can get, it is still a highly effective and entertaining movie with many a suspenseful, memorable moment. Give it a try, you won't regret it. Plus everyone talks as though they were in a madcap comedy caper. Good times! Shaun your lecturer refused to even entertain the notion that films like this were even remotely sci-fi?? The old curmudgeon! Sci-fi/horror all the way. I've just now stumbled onto your blog via this review of a favorite movie of mine. The more I watch it, the more I think this could also be classed, neither as cold war paranoia nor horror/sci-fi, but as another of that specifically Hawks-dominated genre of "The Professionals Just Doing Their Job." When you look at it not from the perspective of the story but focus rather on the characters, you begin to see many elements in common with such other Hawks pix as Only Angels Have Wings, Air Force, even Red River. In this case, I think Nikki's proper comparison should be not to Ellen Ripley, but to Rosalind Russel's character in His Girl Friday: tough cookie, holds her liquor, accepted as one of the boys (heck, she wears pants!). Glad you stumbled upon the blog, justjack - thanks for commenting too! I'm not overly familiar with Hawks's films - for shame! - but I do appreciate your take on The Thing as a Hawksian character study. When next I watch it, I'll be keeping your take in mind. And your comparison of Nikki to Rosalind Russell in His Girl Friday (which I LOVE) makes perfect sense.